Mangaluru, Nov 29, 2017: Design Build Finance Operate Transfer (DBFOT) model, was approved for bus terminal project in Pumpwell by Council of the Mangaluru City Corporation (MCC) on November 28, Tuesday. When the project was tabled during the council meeting for approval of members, MCC Commissioner Mohammed Nazeer said that 7.23 acre land has been acquired at Maroli near Pumpwell for the same. The proposed bus terminal will be taken up on PPP mode. Dakshina Kannada Deputy Commissioner approved the model by Chettinad builders on October 9. The project includes development of road at Pumpwell Junction and construction of underpass on the National Highway. The bus terminal will house 198 bus bays, theatre, mall, multi-level car parking and two- wheeler parking area. Problems debated : Opposition leader Ganesh Hosabettu complained that pumping of sewage waste has not been done in Suratkal area for the past 10 days. Executive engineer said that pumping could not be taken up due to disruption in power supply. During the discussion on waste management, Commissioner Nazeer said that MCC has paid the amount to Antony Waste Handling Cell Pvt Ltd till September for the collection of garbage. 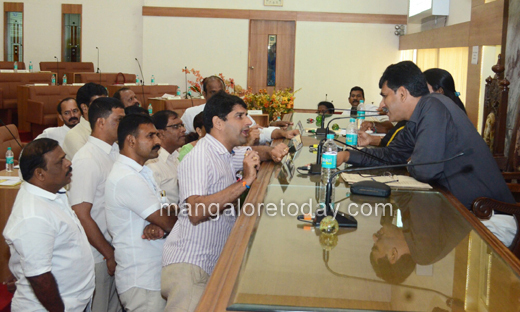 The opposition leaders alleged "nepotism" in the distribution of MCC funds to corporators. The commissioner clarified that the general fund of 50 lakh has been allotted to each member. Some members may have been allocated additional funds based on the priority of the works, he said. 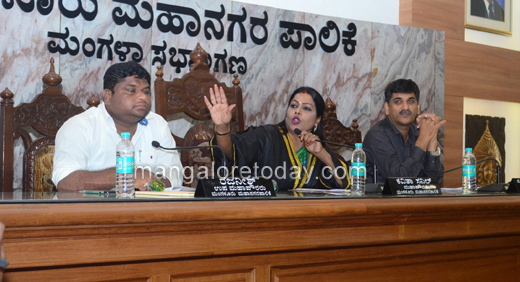 Former Mayor Mahabala Marla, Deepak Poojary, Muhammed and others said that the corporators have been kept in the dark regarding the Smart city project. They wanted to know why the Detailed Project Report was not prepared till date. The Commissioner said that the KUIDFC is the nodal agency for the smart city project. Wadia technologies has availed the global tender for project management consultancy. In the first phase, Rs 218.5 crore is reserved for water supply and Rs 195 crore for UGD works. Development work will be taken up in eight wards where, utility corridors, footpaths, interlock laying and other works will be done, he said. A proposal has been sent for KUIDFC for technical sanction and an integrated DPR is being prepared, the commissioner said. In the next phase, Rs 293 crore grants will be utilised towards LED streetlights, smart water supply, smart bus shelter, roof top solar plants and so on. Corporators Mohammed, Purushottam Chitrapur and others complained about the malfunctioning of street lights in NMPT, Mukka and NITK areas. The Mayor directed the officer concerned to rectify the flaws within 10 days. Vijay Kumar Shetty alleged that M N Solutions, which has availed contract towards the distribution of water bills has not been doing the job properly. Many houses have not been served with bills, he said. The commissioner said that tenders have been invited towards software and backup function of spot billing work. From January, new billing system will be implemented. A special team has been formed for the collection of dues, he said. Deputy Mayor Rajanish, Standing Committee chairpersons Pratibha Kulai, Sabitha Misquith, Nagaveni and Abdul Ravoof were present. Opposition seeks apology from Mayor : During a discussion, the opposition leaders entered into the well of the house and engaged in a heated discussion with the Mayor. 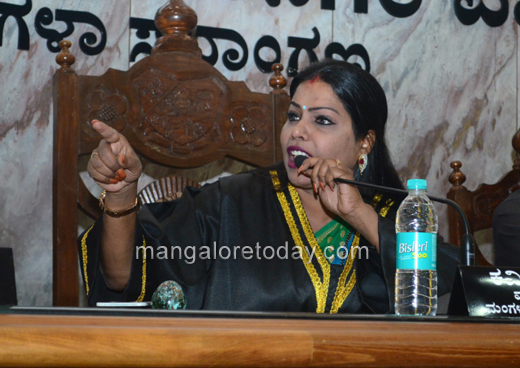 At a point of time, Premananda Shetty and the Mayor were found arguing and the Mayor reportedly used some harsh word and in a bid to defend herself, said she was not "ashamed". Shetty condemned the Mayor for using the word and said that the women members in the council are embarrassed by the gesture of the Mayor. The opposition leaders urged the Mayor to apologise for the inappropriate word she used. 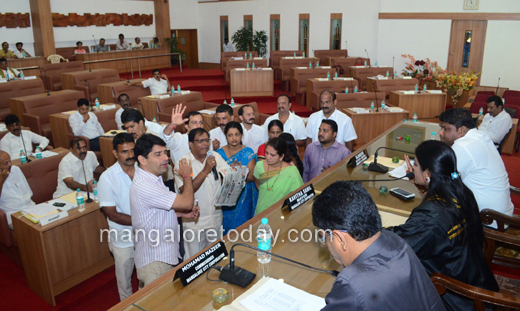 However, Council Whip Shashidhar Hegde intervened and convinced the opposition leaders that the Mayor did not mean any offense. The Mayor, too, clarified that she had not uttered the word for others but for herself. The discussions resumed later.